Our new Rugged extruded aluminum frame ultrasonic thickness gauge is suited for rough environments such as mining facilities, pipeline, bridge and tower inspections, etc and is packed with features typically found on high end models only. 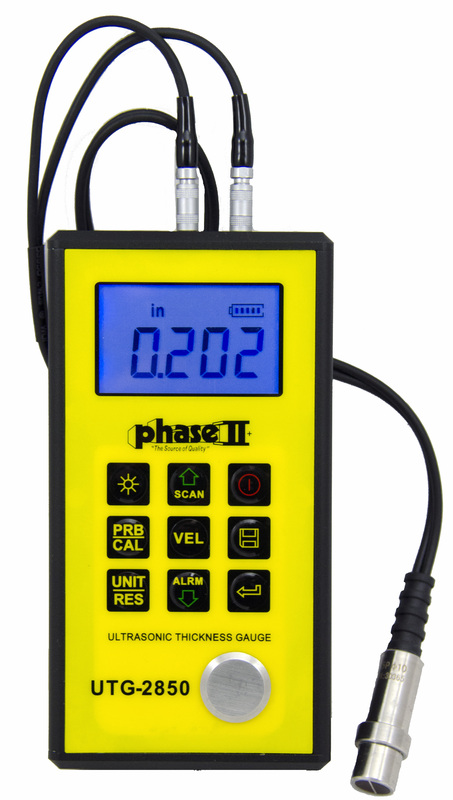 This multi-functional ultrasonic thickness gauge unit offers everything from basic measurement, Scanning Capabilities, Adjustable Sound Velocity, extended memory and USB output capabilities. This dynamic ultrasonic thickness gauge is designed to measure the thickness of metallic and non-metallic materials such as steel, aluminum, titanium, plastics, ceramics, glass and any other good ultrasonic wave conductor as long as it has parallel top and bottom surfaces. The UTG-2850 ultrasonic thickness gauge will accurately display readings in either inch or millimeter after a simple calibration to a known thickness or sound velocity . UTG-2850 ultrasonic thickness gauge comes complete with Certificate of Calibration, Operation Manual and Custom Carry Case.